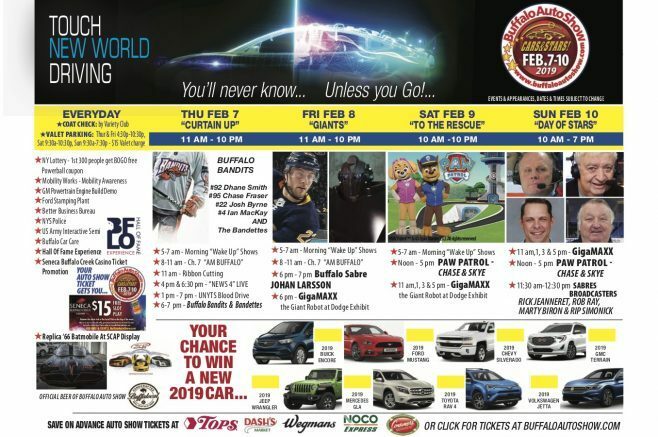 Meet members of the Buffalo Bandits and Sabres at the Buffalo Auto Show! Hundreds of new vehicles will take center stage at the 2019 Buffalo Auto Show, Feb. 7-10 at the Buffalo Niagara Convention Center in downtown Buffalo. But this year they will share the spotlight with countless other special guests and attractions sure to put a smile on the face of every family member! On Thursday, Feb. 7 from 6 to 7 p.m., meet Buffalo Bandits players Dhane Smith, Chase Fraser, Josh Byrne and Ian MacKay, along with members of the Buffalo Bandettes dance team! Buffalo Sabres forward Johan Larsson will make an appearance from 6 to 7 p.m. Friday, Feb. 8, while Rick Jeanneret, Rob Ray, Martin Biron and Rip Simonick of the Sabres will stop by from 11:30 a.m. to 12:30 p.m. Sunday to sign autographs. There will be a small fee for autographs on Sunday, with proceeds to benefit the Buffalo Hall of Fame Experience. Other Buffalo Auto Show highlights will include PAW Patrol’s Chase and Skye, GigaMAXX the amazing eight-foot robot, a replica 1966 Batmobile, and many special exhibitors. Attendees will also have a chance to win a car a day! Please visit www.buffaloautoshow.com for schedules and details. Discounted presale tickets are available for $8 each at Tops, Wegmans, NOCO Express, Dash’s Markets and Consumer’s Beverages locations, and online at www.buffaloautoshow.com. Tickets at the door will be priced at $10. Show hours are 11 a.m. to 10 p.m. Thursday, Feb. 7 and Friday, Feb. 8; 10 a.m. to 10 p.m. Saturday, Feb. 9; and 10 a.m. to 7 p.m. Sunday, Feb. 10. Be the first to comment on "Stars will shine at the 2019 Buffalo Auto Show"